Stuffed grape leaves are delicious and are such a comfort food. These are different than your grandmother's version with an ingredient list that is a mile long with all sorts of spices. We have created a simpler version for those who don't have a lot of time. This recipe is easy and will have your guests begging for the recipe. Soak grape leaves in cold water for 2 to 3 hours. Jarred grape leaves are very salty from the brine solution. Rinse and drain in a colander. Set aside. In a mixing bowl, combine remaining ingredients. Mix well with hands. Place a grape leaf side down. Place about 1 to 2 tablespoons of mixture in the middle. Fold in the sides and roll upward. Think of rolling a burrito, only smaller. 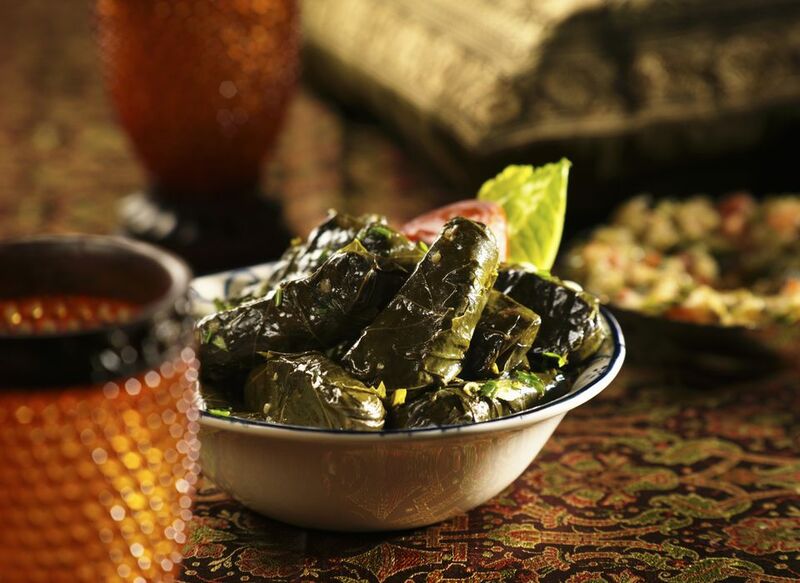 When you have rolled the last leaf, place a heavy plate on top of the stuffed grape leaves in your pan. We use a ceramic plate. This helps keep the grape leaves in place during cooking so they don't shift around. Fill pan with water and bring to a boil. Reduce heat to low and simmer for about 30 to 45 minutes until rice and meat are done.